Today’s modern women, whether working or not are extremely engaged in their daily works, that at the end of the day they become too tired and feel dull. But do they know that exercise is a great way through which they can challenge their own body and keep it energetic? Ladies should take out one hour from their regular agenda so that they can tone their bodies in the gym. They should work on their weight which shouldn’t be too light or too heavy with 10 or more repetitions of each workout. Under the guidance of the trainer in the gym they should implement various kinds of exercises with distinct equipments. Hence women should set a proper workout schedule of five days a week, so that the remaining two days can be taken off from the exercise session. 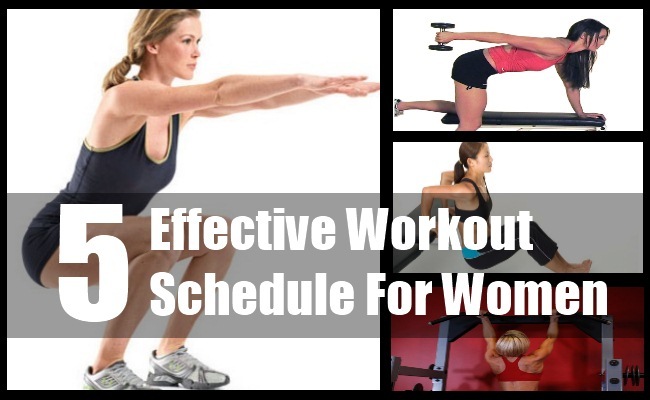 Let’s talk the workout schedule for women which will be effective for them. Ladies should begin their workout with 8 to 12 minutes of warm-up so that your temperature will raise high. Your target on the first day will be the muscle workout of legs and biceps. You can begin doing squats (bends) which covers leg press exercise, sine-standing squats, hack squat exercise, and exercises holding dumbbells.You’ve to execute at lest 3 sets of crouching position with 10 times repetitions. After that you can work on bicep and leg exercises covering leg curls exercise, leg extension exercise, barbell curls, calf raises and bicep cable curl exercise. Thus the whole cardiovascular exercise should be of 25 to 60 minutes. Women should now focus on chest and shoulder muscles. You can do 10 minutes of stair climber, 10 minutes of stationary bike and 10 minutes on treadmill. With the use of dumbbells or barbells, you can try out pec fly exercise; dumbbell pullover position, overhead press, and front and side lateral dumbbell raise workouts. You can carry out three sets with 10 times recurrences. Automatically your chest and shoulders will grow strong. Now the ladies can do workouts on their back and triceps muscles. You can jog for two minutes, sprint for 30 seconds, or else walk for one round and run for another round.You can perform cable rows, dumbbell rows, tricep kick-backs with dumbbell, tricep pull-downs with rope and seated dips exercises. You can repeat these exercises for 5 to 10 times. Ladies can begin with 8 to 12 minutes of warm up, followed by exercises like straight leg dead lifts grasping the dumbbells, preacher curls, seated calf raises and chin-ups exercises. You can repeat each exercise for 10 times. The whole workout of cardiovascular exercise will be of 50 to 60 minutes. The workout on this day will be on the legs and biceps muscles. The total workout period of cardiovascular exercise will be of 20 minutes. The target of workout will be on the chest, shoulders and triceps. With the use of dumbbells, barbells or any other machine, you can perform exercises like flat bench press, alternating dumbbell forward raise exercise, overhead press, overhead dumbbell extensions, and tricep kick-backs exercises.Each performance should be executed in three sets of 10 recurrences. Therefore if women will accomplish the exercises on the basis of their workout schedule five days a week, they will benefit a lot and maintain a healthy body.